TOKYO - Nikon Corporation is pleased to announce the release of the COOLPIX S02, a new COOLPIX S-series model that incorporates advanced functions in a stylish design. 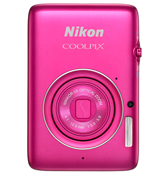 The COOLPIX S02 is the successor to the COOLPIX S01, a camera that was introduced as the smallest and lightest digital camera in Nikon COOLPIX history. The primary features of this camera are its ultra-compact size, which fits comfortably in the palm of the hand, and a stylish design, both inherited from its predecessor. However, its functions and equipment as a camera have been improved. The COOLPIX S02 offers an effective pixel count of 13.2-million pixels and is equipped with a CMOS sensor and a high-performance NIKKOR lens. This combination allows users to enjoy recording still images and movies rendered for superior image and picture quality, even in dark surroundings. In addition, the automatic image overlay technology, which creates a single image from multiple shots captured in quick succession, demonstrates its strength with night landscapes and backlit scenes by making the most of the high-speed performance of the CMOS sensor to brightly render backgrounds and human subjects with little noise or blur. 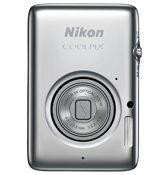 The COOLPIX S02 is also equipped with a large, 2.7-inch LCD monitor for simple operation and comfortable shooting and playback. The elegantly designed body is available in four colors—silver, white, pink, blue (new)—that are pleasing to the eye. Users can keep this camera with them at all times to enjoy capturing everyday scenes that attract their attention. Despite adoption of a larger, 2.7-inch TFT LCD monitor, the camera body is roughly the same size as the COOLPIX S01, measuring approximately 77.1 mm wide, 51.3 mm high, and 17.3 mm deep, for continuation of the ultra-compact size, which is the camera's greatest feature. Smaller than the average business card, the camera fits in the palm of the hand, making it easy to keep with you at all times to capture those unexpected moments, whether hanging from the strap around the neck, or carried in a pocket or bag. By enabling operation of all functions using a touch screen, operational controls have been reduced to the bare minimum for continuation of a smooth, streamlined form regardless of the angle from which the camera is viewed. 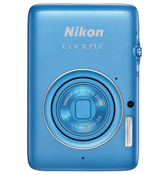 In addition to the always popular silver, white, and pink, the COOLPIX S02 is also available in a new blue color. 3. Offers an effective pixel count of 13.2-million pixels, and equipped with a CMOS sensor, offering Capture beautiful images regardless of lighting conditions. The CMOS sensor built into the COOLPIX S02 is quite an improvement over the CCD sensor. The COOLPIX S02 offers an effective pixel count of 13.2-million pixels, and the COOLPIX S01, its predecessor, offers an effective pixel count of 10.1-million pixels. . The CMOS sensor enables not only capture of beautiful still images, but also recording of 1920 x 1080p, 30-fps full-HD movies with stereo sound and exhibiting superior picture quality. In addition, automatic image overlay technology utilizes the high-speed performance of the CMOS sensor to enable beautiful rendering of images under difficult lighting conditions. It prevents loss of detail in shadows and highlights with backlit scenes, and also reduces the effects of camera shake and noise that often occur with capture of night landscapes, for superior image quality every time. Adoption of a large, 2.7-inch, approximately 230k-dot TFT LCD (COOLPIX S01: 2.5-in.) and a touch screen that enables intuitive operation increases visibility and improves operation. In addition to the COOLPIX S01's four-segment menu screen and shortcut menu that allows users to add images to favorites or delete images, with a simple touch-and-hold operation when displayed full frame on the playback screen, a new Customize My Menu feature has been added. Customize My Menu is a function for customizing operation. The selected setting can be assigned to "My Menu" icon displayed at bottom left in the monitor with shooting (the default setting is flash mode). Settings that can be assigned are self-timer, flash mode, special effects, exposure compensation, image mode, touch shooting, and scene selection. 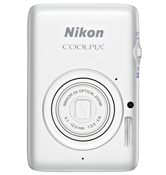 Despite its compact size, the COOLPIX S02 offers a high level of basic performance as a digital camera with features such as its 3x optical zoom NIKKOR lens for coverage of a broad range of angles of view from the wide-angle 30mm to 90mm (equivalents in 35-mm  format), and a high-output xenon flash that enables capture of human subjects and backgrounds with natural levels of brightness. What's more, the camera makes photography even more fun with support for creative imaging with functions like Scene Auto Selector, with which the camera automatically identifies the scene and applies the optimal scene mode; Special Effects, which can be applied prior to shooting to achieve the desired effect (Nostalgic Sepia, High-contrast Monochrome, High Key, Low Key, and a new Mirror effect); and Filter Effects, which can easily be applied to photos already taken (Toy Camera Effect, Soft, Fisheye, Miniature Effect, Vivid Color, Black-and-white, Sepia, and Cyanotype). 1920 x 1080p, p, 30-fps full-HD movies with stereo sound can be recorded. Users can enjoy viewing full-HD movies recorded with the camera in their native high resolution with playback on a TV with an HDMI connector using an HDMI cable (available separately).